At the time of his departure from EKU (Eastern Kentucky University) fireplug Elroy Harris was the All-time leading rusher in school history with 4,555 yards in 3 years, a whopping 5.9 yards per carry, and scored an Ohio Valley Conference Record 58 career total touchdowns. Among Elroy’s accolades was being named the Conference player of the year in 1988 after accumulating 1,543 yards, which led all Division I-AA schools. 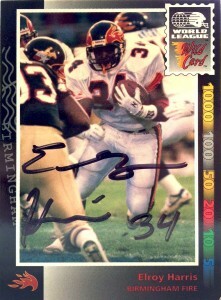 Elroy was a 3rd round pick of the Seattle Seahawks in the jam packed 1989 NFL super draft. Looking for a change of pace in the backfield the Seahawks were stuffed with talent at RB with guys like Curt Warner, John L. Williams, James Jones, Derrick Fenner, and Kevin Harmon. Thankfully Chuck Knox and his infamous ‘Ground Chuck’ offense required so many backs to share the load. Elroy did what it took to make the roster and was utilized primarily on special teams. As a returnman he made appearances in 14 games for Seattle, returning 18 kicks for 334 yards. 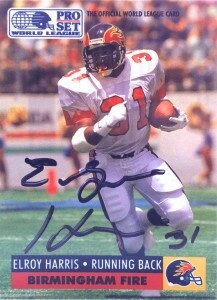 Elroy was not retained for the 1990 season, but with the WLAF on the horizon, he made an excellent candidate for the league. Originally a draft pick of the Montreal Machine, Harris had a speedy debut against the Birmingham Fire. Elroy managed to squeeze out 250 yards and 2 TDs, but found himself cut after Week 4. It’s always been a mystery to me as to why it happened, but regardless, the Machine were content with Ricky Johnson taking the lionshare of the workload to go along with Broderick Sargent. Elroy did not go unemployed for long. He quickly was picked up by a familiar foe- the Birmingham Fire, whose coach, Chan Gailey is a mastermind (even today) of squeezing the most out of players that he can in his offensive systems. Harris stepped into the lineup and contributed another 290 yards and a TD, finishing 4th in the league in rushing, and helping the Fire make the playoffs. 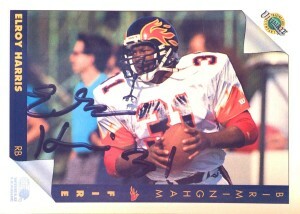 Elroy returned to the Birmingham Fire for the 1992 season, and put up a respectable 470 yards on the ground and 5 TDs, sharing the backfield with Jim Bell as the Fire returned to the playoffs. Why looking for Elroy Harris for 7 years sticks out in my mind is because he has a card in each set that’s very nice looking. I thought that finding him was going to be much easier than this, but who would’ve thought there were hundreds of Elroy Harris’s across the United States? It took a bit of extra effort cross referencing cards and public data to finally track down the elusive Fire runningback. While I just threw a prayer to the wind, I had a gnawing feeling that this address was the one. I was just surprised to get a response so quickly, and a nice note to boot. Elroy is currently a head mechanic and a coach at his local high school. Apparently he gets little fanmail, as he was really happy to receive this treat letter from me and wished my father and me all the best. Fort Valley State is a small school pipeline for NFL talent producing over the years such names as Eddie Anderson, Greg Lloyd, Nick Harper, Rayfield Wright, and Tyrone Poole. Darryl Holmes appeared in between Lloyd and Anderson playing for Wildcats during the mid 80s. Going undrafted, Holmes joined the New England Patriots in 1987 playing in 15 games. As an extra safety in the formidable Patriots secondary, Holmes made his living as a special teams burner. 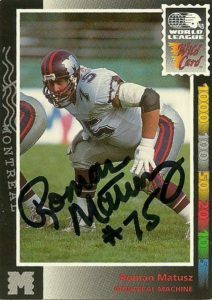 He played 3 seasons in the NFL recording 1 interception for 4 yards and 2 fumbles. 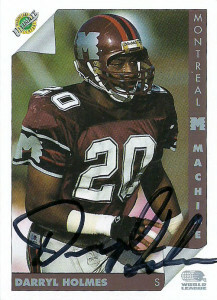 After sitting out a season, Darryl was drafted by the Montreal Machine of the WLAF in 1991. 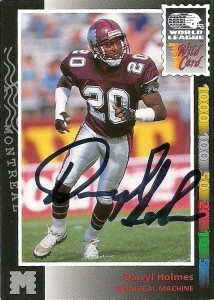 During the 1991 season, Holmes recorded 59 tackles and an interception. He returned to the team for the 1992 season and contributed another 2 interceptions for 28 yards. Holmes has been involved in numerous NFL Play Football initiatives and football camps since retirement around his home town.